I wanted to get this post up last night, but I just didn’t feel right staying up to write it after JoanMarie went to bed. Yesterday was one of the most anxiety plagued days of my life. As you may know, JoanMarie recently had emergency surgery. The surgery went well and she’s been recovering at superhuman speed. But we were still waiting to hear from the doctor as to whether or not what they removed was malignant or benign (cancerous or not). The news was supposed to come on Tuesday. It didn’t. If we didn’t hear on Wednesday, we wouldn’t hear until Monday because of Thanksgiving. So we tried to keep ourselves distracted, although her phone was never far. We went to brunch, and at one point, an odd yet beautiful moment occurred. I don’t remember what JoanMarie was talking about, but I noticed how full of joy she looked. Her smile and her eyes were as bright as ever. If you’ve ever been around her when she’s like that (which is often), you know how contagious that is. It looked like such an out of place emotion for what was “really” going on, yet somehow she allowed herself to purely enjoy the moment. But as the day went on and the clock ticked closer to 5pm, when the doctor’s office would close for the holiday, things felt more tense. Friends and family were calling and texting because everyone wanted to know if we’d heard anything. At one point, shortly before 5, I went upstairs. I was full of that need-to-fix-things attitude, but I didn’t know what to do. Really, what could I do? So I sat in my writing chair, and that image of JoanMarie’s joyous expression came to me. I still couldn’t remember what she was saying, but I was able to watch her enjoy the moment all over again. It’s my favorite expression in the world! And with that image playing in my mind, I did something I’m not known for being real good at. I did something that usually feels silly to me. But I prayed. It was the only thing left that I could do. I just felt so sad and happy and nervous and joyous all at the same time and I needed to tell somebody. Then some friends came over, bringing JoanMarie tea, magazines, and pajamas. The doctor’s office closed and the evening went on. And then the doctor called. We could enjoy our Thanksgiving, she said. It was totally benign. We put on a really fast and funky song because it fit the moment, but what we really wanted to do was slow dance. So we danced slow and close to a fast and funky beat…and that’s exactly what the moment called for. ...couldn't drag me away from speaking to teens and English teachers, which I was given the chance to do in Philadelphia a few days ago. But as I said in my previous post, I did have to leave Philly a few days early and miss several engagements. So to all of you who came out to an event to hear me speak or get your book signed, and yet I wasn't there, I apologize. Unfortunately, there was a medical emergency in my family. To those of you who knew what was going on and e-mailed your prayers, JoanMarie and I both thank you tremendously. Things are looking good. JoanMarie also wants to share with you a couple of her favorite hospital gifts. JoanMarie, Johnny Depp (both of them), and I are back home now. For the next several weeks, while JoanMarie reads her magazines and relaxes, I'll be cooking and cleaning and watering plants and running errands...and there's nothing I would rather be doing. And hopefully I can see anyone I missed in Philadelphia real soon! My Philadelphia visit has to be cut short a few days, but I thought I'd quickly share some of the fun times and cool people that made these two days so special. On Thursday, I gave two library presentations where several high schools sent students. Every student had been given a copy of Thirteen Reasons Why before their visit, which always makes the Q&A much more interesting. And I finally autographed a book for someone with the title "Sister"! On Friday morning, at the National Council of Teachers of English conference, I was on a panel with David Levithan and Lauren Myracle to discuss intellectual freedom. I'd never met Lauren before and had only caught a glimpse of David in the past, so I was really looking forward to this panel. We've all had different experiences with our books being banned or challenged, so hearing their thoughts was fascinating. But beyond what they had to say about tampons, thongs, erections, and the word %$@&, they both seemed like genuinely wonderful people. After I signed books on the conference floor, I grabbed some autographs and photos of my own. As many of you know, Gordon Korman is a rock star to me. When he offered a blurb for my book, I was in heaven. But I actually haven't seen him in person since before I'd even finished writing Thirteen Reasons Why. So it was great to catch up! I love Gene Luen Yang's Printz Award winning graphic novel, American Born Chinese. Though I already have a copy back home, when I saw that he was signing books, I had to buy another so I could have it autographed. Of course, when I heard that Sandy Asher was nearby, I had to finally meet her. But no, we aren't related...though we tried to find some distant relative in common. And in case you were wondering, yes, of course I devoured a Philly cheesesteak during my visit! I'm heading to Philadelphia for several days of speaking at the NCTE and ALAN conferences. (Hey, maybe I can sneak in a ghost tour while I'm there!) If you're attending either of these conferences, be sure to say hi. Because you love getting autographs from some of your favorite authors. Because you love watching me get all nervous when I ask some of my favorite authors for autographs. I think I hid it well, but I had an insane amount of butterflies in my stomach all day. One minute I would be completely excited, and the next minute totally nervous. Seven months ago, a high school drama teacher asked if her school could turn Thirteen Reasons Why into a play...and I said yes. At seven in the evening, I would find out. Thankfully, the school kept me busy during the day. I began the day in a discussion with the Seminar for Scholars group. This group meets about once a month to discuss controversial issues with guest speakers. It's been a long time since I've heard any group of adults dissect and discuss moral issues with as much openness and honesty as this group. During the three lunch periods, I gave three presentations in the library. And finally, after who-knows-how-many school visits I've done, I finally met someone named Hannah Baker! After school, I walked around the beautiful downtown streets. The alternative would've been to pace back and forth in my hotel room, watching each minute pass on the digital clock. Finally, it was six o' clock and I headed back to the school. The halls were decked out with posters depicting the different covers of my book from around the world. From the ceilings, they hung giant cassette tapes. I chose a seat near the middle of the audience. J-113. When the lights went down, my pulse began to race. For the next two hours, I sat in my chair and watched Thirteen Reasons Why brought to life on a high school stage. When the entire cast returned to the stage at the end of the show, I clearly had my answer as to whether or not I was crazy to entrust my story to these students. No. I was nothing but honored and awed by the performance. The staging and lighting were beautiful and extremely creative. The momentum of the story kept building, and every actor and actress fully embodied their roles. They literally brought Hannah, Clay, Tony, Jessica, Courtney, and the rest of the characters (yes, even Bryce) to life right in front of my eyes. Many times throughout the night I kept thinking, I can not believe what I am experiencing right now. When I was called to the stage, I took a moment to shake the hand of the actor who played Clay (in the yellow shirt) and give the actress who played Hannah a hug. She had to memorize an unbelievable amount of dialogue! From here on out, I will always consider this Friday the 13th as one of the luckiest days of my life. The day I've been anticipating since March is almost here. Though I won't be attending the show until tomorrow night (Friday the 13th, of course! ), Antioch Community High School is right across the street from my hotel. And I knew the cast would be there getting ready for tonight's performance. And I just couldn't wait to meet them! So I walked on over. Then I went backstage to the make-up room to let everyone know how deeply honored I am that they chose to turn my book into their fall production. They are an absolutely amazing group of students. I wish I could've hung out with them longer, but they had to finish getting their make-up on for tonight's debut performance. But I couldn't leave the premises without seeing if the rocketslide really works. It's ridiculously amazing. It would be absolutely unbelievable if I didn't have proof. And the news I received just a half hour ago has me literally crying with joy right now! Released more than five months earlier, Thirteen Reasons Why debuted on the list at number 10 in March of 2008. 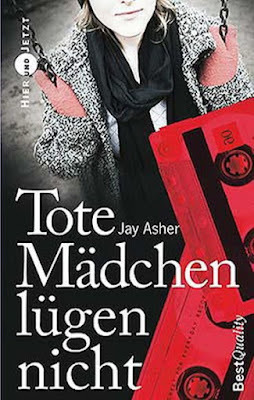 In March of 2009, on its 19th visit to the list, Thirteen Reasons Why reached its highest position at number 3. 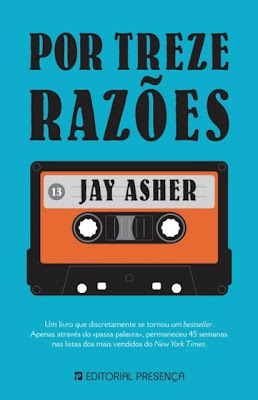 And now, two years after its release, Thirteen Reasons Why has made its 52nd appearance on the list...meaning it has spent a full year as a New York Times bestseller!!! All of my friends and family members who've been a part of this roller-coaster journey know I love them and I thank them for putting up with me as I stressed about how I could better promote this very personal book. But I want to personally thank a few people on the business side of things who always treated Thirteen Reasons Why as if it meant just as much to them as it did for me. Ben Schrank (my publisher), Laura Rennert (my agent), Allison Verost (my publicist), and Kristen Pettit (my editor...Happy birthday, Kristen!) were the absolute best team I could've hoped for. So many people at Penguin played very important parts in the success of this book and deserve way more credit than I could possibly give here (like Don Weisberg, Emily Heddleson, Leslie Prives, Scottie Bowditch, Shanta Newlin, Courtney Wood, Pamela McElroy, RasShahn Johnson-Baker, Barbara Marcus, and on and on and on…), but I must call attention to Christian Fünfhausen, the man behind the jacket art. He's responsible for enticing so many people who'd never heard of this book to pick it up before my words had a chance to do their job. And I want to thank all of you who read my book and felt it was something other people needed to read, so you told your friends about it...and they told their friends...and they told their friends...and a few of them, who just happened to be standing next to me in random bookstores, even told me that I needed to read my book! You have no idea how much your support for both Thirteen Reasons Why and me have meant over these years. All comments need to be in by 11:59pm PST on Thursday, November 5th. I'll announce the winner a few minutes later. Good luck!